Is the future your comfort zone? Put your focus on tomorrow when you earn a Ph.D. in Human-Computer Interaction from the IU School of Informatics and Computing at IUPUI. Understanding how to study and create optimal user experiences is crucial to developing and advancing tools for the digital age. By taking part in innovative research at the forefront of HCI you’ll shape how the world uses technology, from can openers to computers. In our applied, research-based program, Ph.D. students identify new problems in HCI and generate new knowledge to solve them. You’ll collaborate in research labs and be mentored by faculty with real-world expertise in UX research, social computing, accessibility, interaction design for health, android science, and other emerging HCI areas. 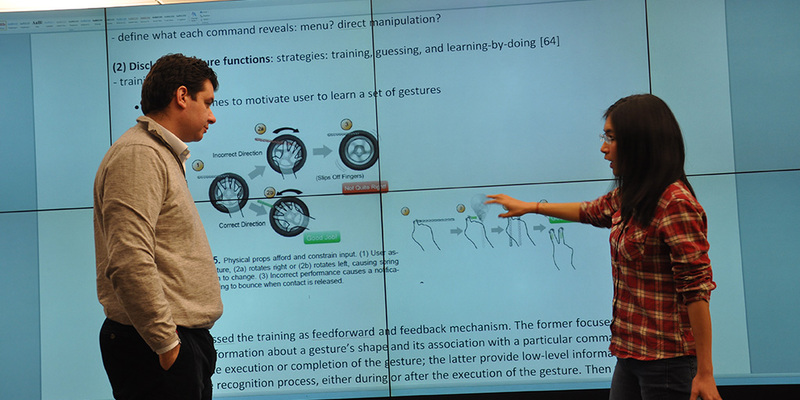 Students conduct HCI and usability research that spans disciplines including computing, communication, robotics/android science, biomedical devices, and human and social sciences. Working on the IUPUI campus, with its strong health care focus, offers unique opportunities and facilities. Our Ph.D. in Informatics with a Human-Computer Interaction specialization is 90-credit-hour program that integrates computing, usability, interface design, the social sciences and other disciplines in the design and development of user-friendly technologies, software and information systems. The program includes core courses, research rotations, your choice of minor, qualifying examinations, and a dissertation. STAT 516 Basic Probability Appl. You must complete a minor within a domain appropriate to your choice of specialization and/or research area. All courses must be graduate-level and outside the HCI program. Written Exam – You must successfully complete a written qualifying examination by the end of the program’s second year. The exam is established by faculty and covers subject matter taken in the program’s core courses. The exam may be retaken once. Oral Exam – An oral examination takes place within weeks after successful completion of the written exam. You must pass both the written and oral exam before passing on to Ph.D. candidacy. The oral exam is based on the student’s response to the written exam and core course material. The exam may be retaken once. Proposal: The research proposal for the dissertation must be approved by the student’s research committee. The student will defend the dissertation proposal at a public colloquium in the school. The review should be completed within one-year after passing the Qualifying Examinations. Defense: A written elaboration of significant original research must be successfully presented to the research committee in a public defense as described in the Graduate School Bulletin. Please refer to the IUPUI Graduate School Bulletin for more details on the dissertation process.